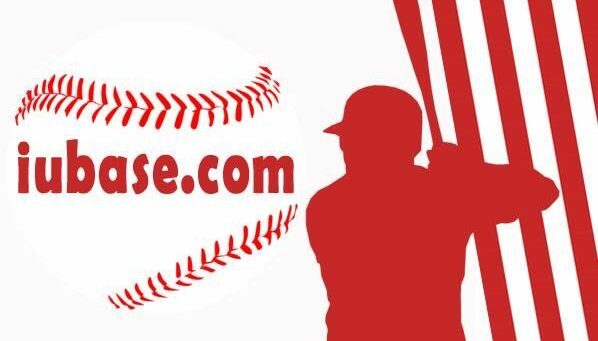 In January I wrote an article ( http://iubase.com/2018-b1g-baseball-strength-of-schedule-preview-by-carl-james/ ) looking at the unbalanced schedule in the B1G Ten and how it can play an outsized role in determining a league champion. I will review the large points here, but if you want the details I recommend revisiting that article. 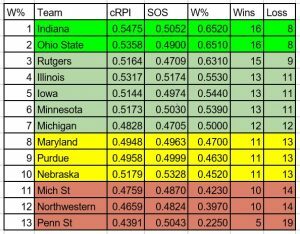 I performed a purely mathematical exercise where I took the 2017 B1G regular season and tournament results for all league teams and used the RPI formula to adjust for strength of schedule. With this adjustment Indiana improved from an actual 6th place finish to a close 2nd place finish, as IU had one of the harder league schedules. I then took these results and applied them to the 2018 schedule. The problem with that was that there was no accounting for changes in performance year over year. So I promised to revisit this after we had a month of non-conference play with at least some data to tell us how good these teams are in 2018. I stress that this only one month of data. I’m known as iubase.com’s “RPI guy” but I only focus on RPI because the NCAA focuses on RPI when making tournament selections. I do not profess that it is the most accurate measurement of quality of performance. There are two other methodologies I know of that try to come up with a result that better measures actual team quality. Those are Boyd’s World’s ISR ( http://www.boydsworld.com/baseball/isr/currentisr.html ) and Warren Nolan’s ELO Chess (http://warrennolan.com/baseball/2017/elochess ). I wanted to create a baseline of quality based on 2018 performance. What I have done was take the rank order of ISR and ELO Chess along with the current RPI and simply average them together to get a pseudo national rank for each team. 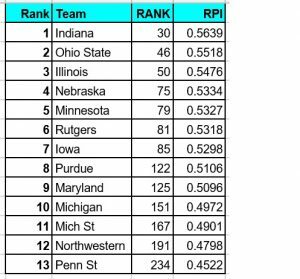 I then pulled up the 2017 RPI ranks, located the team with the rank I got for each B1G Ten team and assigned them the corresponding RPI of that rank. This is incredibly crude, but takes multiple sources into account and aggregates what different algorithms are seeing and is the best I can do with the limited time I apply to this. 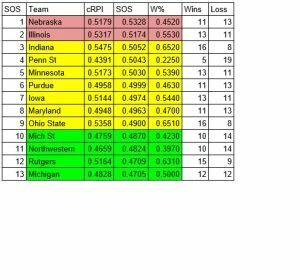 So I then plugged these into the 2018 B1G schedule a few times and adjusted the cRPI down slightly so to get an even number of wins and losses (as conference games are all played among each other). Here are the results in strength of schedule order. I highlighted to show tiers of difficulty. Indiana has the hardest schedule of the second tier, but Nebraska and Illinois have it much tougher. As Indiana fans, we have to like that we are seeing the Hoosiers predicted on top with a share of the B1G title in this exercise. You might notice that despite the fact that both IU and Ohio State have identical 16-8 records here, Indiana has a slightly higher win percentage. That is because the win percentage was calculated first, and then a win/loss was calculated and rounded to the closest whole number based on a 24 game season. Again this is taking actual results so far and plugging them into the 2018 schedule. This prediction takes no “eye test” into account. It is strictly mathematical (and crude math at that). I think it is useful though as way to start to look at the league season, because it is so hard to guess who will be really challenging the Hoosiers for the title. Originally I thought it would be Minnesota, but now Ohio State and Rutgers are playing significantly better than last year so far and the Gophers have series with both of them. This moved Minnesota from an easy strength of schedule to right in the middle. Indiana’s strength of schedule here is a bit lighter than the one based on 2017 results. Most of the changes are a wash but Northwestern and Maryland are playing bad enough to drag the strength of schedule down a bit. 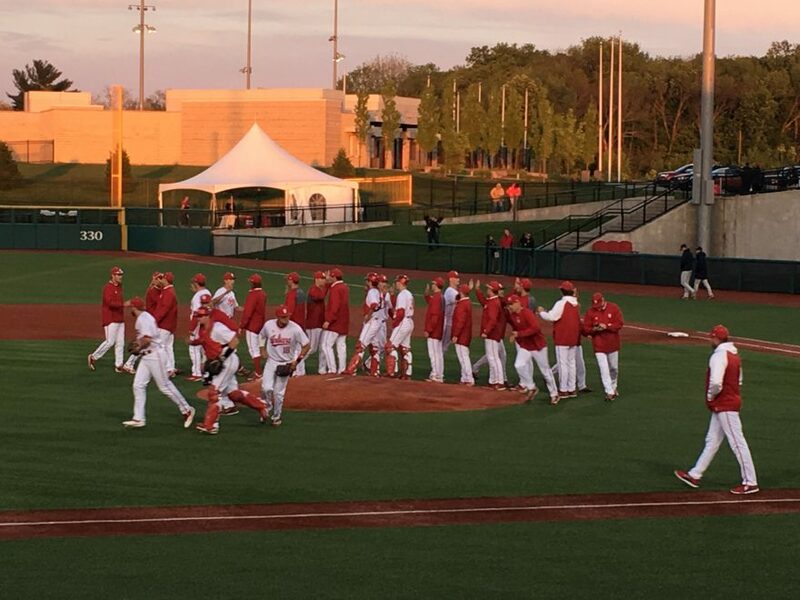 Now we get to see B1G baseball on the field, and it will be the players, not the algorithms, that will decide a champion. I will be tracking strength of schedule to see if it distorts league ranks again and you will see those updates in future articles.